A lot of organizations spend their time, effort and energy on the mechanics of their messaging. Very few companies focus on the formulation of the messaging itself—and they’re missing an incredible opportunity to create value for their customers and solidify a strong competitive advantage. There has been a lot of talk lately about insights and how they can be used within the sales process. When they’re used correctly, insights have the potential to significantly outperform standard facts-and-features-based selling and earn your team and you more wins—as long as your team really knows how to create provocative insights that drive decisions. Recent research has shown that up to 80% of buying decisions are being shifted to the executive level. Are you and your team equipped with the right tools to reach—and engage—the C-suite executives who will give the ultimate “yes” or “no” on your deal? Can you quantify the value you bring to your customers? Can you communicate it in terms they can understand? Or are you simply selling products and services that you believe your customers need? Too often, proposals end in a competitive “bake-off,” in which any number of companies line up to work with a large customer, proposals in hand, ready to battle it out in a spec war, a features war or, in the worst case scenario, a price war. The number one problem I find when working with marketers and sales professionals is that their marketing and sales messages rely on information rather than persuasion. Author Malcolm Gladwell has sold more than three million copies of his breakout book, The Tipping Point, and a million copies of each of his subsequent books. Considering that these are business management books, not mainstream biographies or novels, this sounds like quite a feat. Recent research has shown that less than 50% of our customer communications, content and sales conversations are relevant to our customers’ needs. And in today’s consumer-driven marketplace, delivering irrelevant messages means that you’ll get tuned out. In this article, you’ll discover four steps to create persuasive, customer-focused marketing resources that inspire not just interest, but action. Purchase “4 Steps to Developing Marketing Materials That Inspire Action, Not Just Interest” for $1.99. When marketing messages are done right, they attract prospects who are primed and ready to make a decision. However, when your marketing messages fall short, they may end up repelling potential customers and hurting your competitive position, making your sales team’s job difficult, if not impossible. Are you derailing your sales process by making any of these deadly mistakes with your marketing messages? 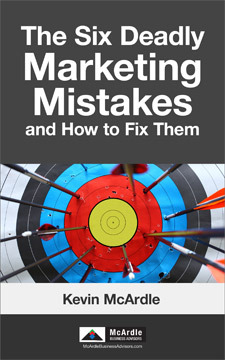 Purchase “The 6 Deadly Mistakes You’re Making with Your Marketing Message” for $1.99 and discover where your marketing may be falling short. You’ll also discover how to turn these mistakes into wins for your company. In this price-driven economy, the conversations you have with your customers are your best opportunity to set yourself apart and edge out your competition. In other words, your company’s best chance for success lies squarely in the hands of your sales people. So how do you make sure all the members of your sales team—despite their varying levels of skill and experience—are having the right conversations with your customers? In this article, you’ll discover six steps for giving your sales team the messages, tools and skills they need to move their sales conversations forward at every step within the customer buying cycle. 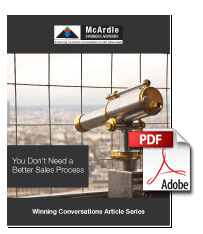 Purchase “Six Steps To Creating Sales Conversations That Win More Deals” for $1.99. A lot of organizations spend their time, effort and energy on the mechanics of their messaging—the channels that get their message out there, such as social media, websites or direct sales processes. Very few companies focus on the formulation of the messaging itself. In this article, you’ll discover how understanding these eight cash flow drivers will help you and your leadership team stay focused on what really matters to your bottom line. You’ll also learn how to manage these factors effectively and move your business toward more consistent positive cash flow, securing a long-lasting future for your company. Purchase “Creating Healthy Cash Flow in Your Business: The Eight Cash Flow Drivers” for $1.99. Are you wasting time and money on marketing that simply raises interest—but fails to generate action? Many companies throw away their marketing dollars—and tie the hands of their sales force—by making six deadly marketing mistakes. I’ll take you through the six deadly marketing mistakes most companies make. I’ll also show you how a few simple adjustments can significantly improve your results—and create marketing strategies that get results. Take a moment to consider where you want your organization to be in 6-12 months. Now ask yourself: Do you have the right team to get you there? In this webinar, you’ll discover how to solve the #1 problem that holds companies back from achieving their goals: their people. When you have the right people in the right seats, executing your vision becomes significantly easier. You’ll spend significantly less time on your “people problems” and more time realizing your company’s vision at the highest level. Purchase this webinar in MP4 format for $4.99. You may also want to download our instructions for viewing and transferring to your iPad/iPhone. Want better results from your business, better results from your people and better results from your time? During this presentation, you’ll discover a set of simple, practical tools to align the six components of your business to help you 1) master the moving parts of your business, 2) focus your available resources in one, unified direction and 3) get immediate traction in your market. To download this webinar as an MP4 file, right click on this link and choose “Save Link As:” Download “Accelerate Your Business: Six Keys To Better Strategic Execution.” You may also want to download our instructions for viewing and transferring to your iPad/iPhone. Think you have your arms around your company’s competitive advantage? Think again. When I ask the CEOs I work with to share their company’s advantage, they tell me things like “customer service,” “quality” or “reputation.” Here’s the hard truth: everyone uses language like that. Those three qualities aren’t differentiators. They’re platitudes—and they do very little to 1) give you a true edge over your competition that 2) convinces your customers to choose you over everyone else, even when you’re not the lowest-price provider in the field. To create a real competitive advantage for your company, you need to move from vague and imprecise messages to ones that are solid, meaningful, relevant. Discover how in this webinar. To download this webinar as an MP4 file, right click on this link and choose “Save Link As:” Download “Uncovering and Communicating Your Competitive Advantage.” You may also want to download our instructions for viewing and transferring to your iPad/iPhone. Every marketer and sales professional—whether they know it or not—is in the story business. In other words, if you can’t tell it, you can’t sell it. If you’re finding it difficult to stand out from your competition—or if you can’t seem to get your prospects to act on your proposals—storytelling is an incredibly powerful tool. Without it, though, you may struggle to attract interested leads, let alone close new business. Discover how to leverage this powerful tool to your advantage in this webinar replay. To download this webinar as an MP4 file, right click on this link and choose “Save Link As:” Download “Ignite Your Marketing and Sales with the Power of Storytelling.” You may also want to download our instructions for viewing and transferring to your iPad/iPhone. Are you wasting time and money on marketing that simply raises interest—but fails to generate action? Many companies throw away their marketing dollars—and tie the hands of their sales force—by making six deadly marketing mistakes. These mistakes create marketing messages that your prospects simply tune out, making both your company—and your products and services—invisible. In today’s competitive environment, “invisible” quickly translates into “insolvent.” Discover whether you’re making these mistakes—and how a few simple adjustments can significantly improve your messaging and set up your sales team for easier, quicker wins: To download this webinar as an MP4 file, right click on this link and choose “Save Link As:” Download “The Six Deadly Marketing Mistakes—and How To Fix Them.” You may also want to download our instructions for viewing and transferring to your iPad/iPhone. I’ve had a number of clients recently who want to improve the sales performance of their teams. Their self-diagnosis? “We need a better sales process.” This, I tell them, isn’t the best solution. In fact, a few years back, a McKinsey study revealed that 75% of the efforts at companies using one of the hottest sales process methodologies in the field—solution selling—were deemed failures within three years. That’s because it’s not about the sales process. It’s about having the right message, one that clearly explains to customers why you’re the best choice for them. The right message will help your company stand out, no matter how many other companies are operating in your niche—and even if you’re not the lowest-priced option. Discover more in this Executive Insights webinar. To download this webinar as an MP4 file, right click on this link and choose “Save Link As:” Download “You Don’t Need A Better Sales Process—You Need A Better Sales Message.” You may also want to download our instructions for viewing and transferring to your iPad/iPhone. If your sales numbers aren’t as spectacular as you hoped they would be, it’s probably not your strategy that’s to blame. It’s more likely that your messaging is undermining your team’s performance. So many organizations are still using conventional sales messaging techniques, ones that do very little to convince your customers that they’d be crazy to do business with anyone else but you. Download this latest Executive Insights webinar and discover the four messaging mistakes that may be holding your team back: To download this webinar as an MP4 file, right click on this link and choose “Save Link As:” Download “Four Reasons Why Your Sales Strategy Isn’t Working.” You may also want to download our instructions for viewing and transferring to your iPad/iPhone. Too many executives, marketers and sales people make the critical mistake of focusing their message on answering the second question—who you are, what you do and why you’re better than the competition. However, here’s the problem: Even if your customers agree that you’re the right choice, they may not agree that it’s time to do something different than they’re doing now. If you want to significantly grow your business in 2014, you’ll need to challenge your customers to do something different—to take action. In this Executive Insights Webinar, you’ll discover how to develop compelling and provocative “Why Change” messages that 1) challenge your prospects’ status quo and 2) move them to say “yes” to your proposals. To download this webinar as an MP4 file, right click on this link and choose “Save Link As:” Download “Move Your Prospects to Action by Breaking the Status Quo Barrier.” You may also want to download our instructions for viewing and transferring to your iPad/iPhone. Focusing your sales and marketing on value is a powerful way to avoid those deadly price wars that erode your margins and reduce customer loyalty to dollar signs. By focusing on the real, measurable, bottom-line value that your product or service offers your customers, you give your team the chance to win new business without using price as a weapon. However powerful this approach can be, if you fail to equip your sales and marketing team with the tools they need to leverage value, it’s an approach that’s destined to fail. In this Executive Insights Webinar, you’ll discover 3 ways to demonstrate how your solutions create real and quantifiable business value for your customers. You’ll also discover the 3 mistakes many businesses make while putting these strategies into practice—mistakes that undermine their team and cost them deals. To download this webinar as an MP4 file, right click on this link and choose “Save Link As:” Download “3 Strategies to Avoid Price Wars and Close More Deals.” You may also want to download our instructions for viewing and transferring to your iPad/iPhone. A recent study from the company Sirius Decisions reveals that executives value having business conversations 4 times more than they value having product conversations. However, executives also report that only 24% of sales people they encounter understand their business, leaving a whopping 76% unprepared to have these high-level business conversations that executives are seeking. (Source: Forrester Research) In today’s tough business environment, even modest investments can require executive-level approval. Is your sales team equipped to create the right conversations with the C-level executives whose approval they need to book business? In this Executive Insights webinar, you’ll discover a 4-step blueprint to help your sales team create compelling, executive-level conversations that close more deals To download this webinar as an MP4 file, right click on this link and choose “Save Link As:” Download “Creating C-Level Conversations That Close More Deals.” You may also want to download our instructions for viewing and transferring to your iPad/iPhone. Provocative selling is a bold new method that pushes your customers to understand their business challenges in a new way, with your product or service aligned as the solution. It has the potential to significantly outperform standard facts-and-features-based selling, earning your team more wins, bigger wins and faster wins—as long as your team knows how to create the provocative insights that drive decisions. In this Executive Insights webinar, I’ll show you the four types of insights available to your team—and how your team can create the effective insights that provoke faster decisions in your prospects and customers. Armed with these skills, your marketing and sales team will understand how to engage your prospects more quickly and easily, while moving them toward a quick decision to shorten your sales cycle, increase your win rate and close more deals. To download this webinar as an MP4 file, right click on this link and choose “Save Link As:” Download this webinar. You may also want to download our instructions for viewing and transferring to your iPad/iPhone.